Nordic walking is a sport for everyone, can be done year round and in the open air. It is an activity performed with specially designed walking poles which are used to push against instead of to support the walker. 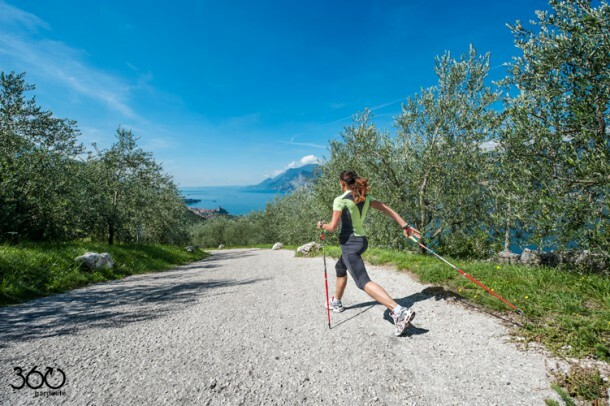 Nordic Walking is not to be confused with trekking, hill walking or trail running as the poles are not planted in front of you but in a specific way that increases the use of the upper body. Nordic walking was originally a summer training regime for cross-country skiers. Now it’s a recognised way to turn a walk into whole body exercise that can be done by anybody anywhere. It is a full body work out which uses 90% of muscles and tones the upper and lower body at the same time. Because Nordic Walking doesn’t feel like hard work you’ll be happy to walk further and for longer. Nordic walking has become a life style for those who love to stay healthy. To walk is a simple and natural movement and to do it in close contact with nature is good for the body and even better for the mind. You can nordic walk on any kind of terrain and even on different slopes as long as they aren’t very steep. The ideal slope is between 4 and 8%. At Malcesine you can walk along the lakeside on the cycle path that connect Navene with Brenzone. If you wish to get away from the lake and immerse yourselves in the tranquility of the hillside paths, there are many routes you can follow, all at low altitude and all open year round. Here I suggest you 2 lovely 12km walks in the Malcesine area. The first one is over various types of terrain, suitable for everyone and walkable all year round. You leave from Malcesine on the bike path heading north to Navene and from here go uphill on the path which takes you to Monte Fubia. You come back to Malcesine along the mule track via Vacco. Click here to read more. The second one goes along the beaches around Malcesine and over the lower hills that surround Malcesine. It goes over long flat areas with some short ascents and easy descents. It is suitable for everyone as 90% of it is tarmac. Click here to read more.